If you've got a new Mac mini and you've already got a keyboard that works with it, you're sorted. Plug that in and use it forever —or until you start to miss some features that you can get in alternatives like backlighting or a numeric keypad. Or until you wear yours out. Or until you just want a change. Don't underestimate the difference that swapping keyboards makes And definitely don't underestimate the value of a keyboard that you like. Maybe you spend all your time staring at a screen but if you skimp on the keyboard, you'll forever find typing a chore. So given that there are about three issues to consider and then an impossible number of different keyboards to choose from, here's what you need to think about —plus some of our favorites as recommendations. If you were getting an iMac then you'd be putting the keyboard right in front of the screen. If you were getting a MacBook then, well, you'd have a keyboard built in but there are still reasons to buy alternatives. MacBooks can work with the lid closed, like a flatter Mad mini, for instance. If you want to do that or maybe want to elevate your MacBook on a stand, you're still going to position that external keyboard in front of the machine. In comparison, people can and many do use their Mac mini on their desk or on a shelf somewhere else. This makes two differences. One is that if your Mac mini is halfway across your office then you're not going to be using a wired keyboard. The odds are, though, that you also just won't be typing on anything all that much. 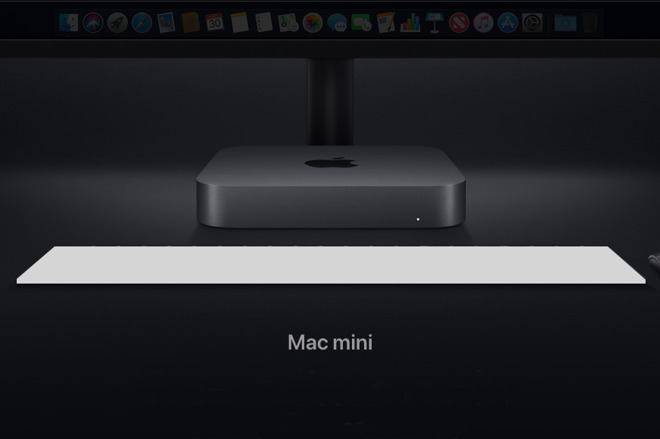 That distant Mac mini is going to be a server more than a machine for general, everyday working. So if that's you, get a cheap wireless keyboard for occasional use. Many of the same portable keyboards we've recommended for iOS devices would do you for this too. When you're going to be doing a lot of typing work on your Mac mini, however, keep that Mac close and the keyboard closer. Keep it close enough that it doesn't make a difference whether you go for wired or wireless. Wired keyboards where you directly connect them to your Mac mini have the obvious advantage that they get their power from the machine so you never have to think about recharging them. Plus you never find that the Bluetooth connection has mysteriously dropped. They should also be faster that wireless ever can be yet we defy anyone but a gamer to tell the difference in typing between the two sorts. Also, battery power is sufficiently good now that having to recharge every month, every three months or sometimes just every year is a burden we can live with. Consequently our recommendation is that there's nothing in it —unless you're going to be travelling. It's not the most practical thing to take your desktop Mac's keyboard with you wherever you go but you can do it and wireless keyboards will typically work with iOS just as well as they do Mac. Apple's wireless Magic Keyboard ($99) is good for travelling because it's small, flat and has an off-switch to stop the battery being run down through accidental jostling in your bag. That off switch doesn't matter on your Mac mini but being flat can be good because arguably it gives a good typing experience. And the smallness is definitely useful on a crowded or messy desk. This keyboard would be the one all others are measured against simply because It's what Apple bundles with the iMac but it's also just very good. 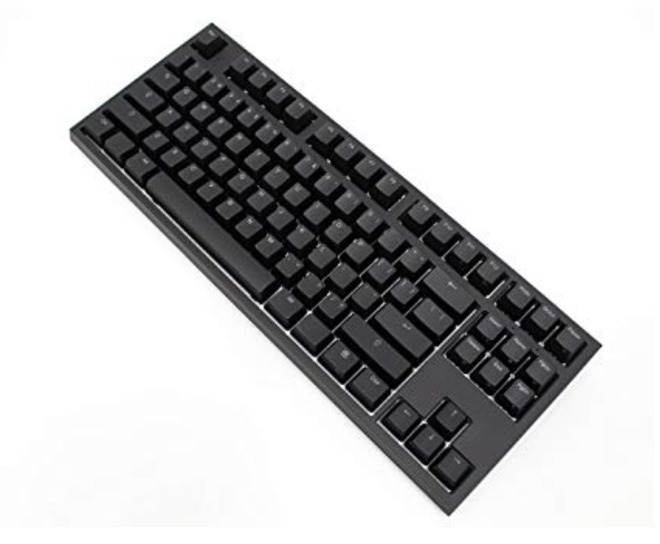 We were partial to the Logitech K811 wireless keyboard which is just a little bigger than Apple's but this is now discontinued and only available at inflated prices by secondhand sellers. Logitech's current closest equivalent is the Logitech K380 which is a very good $22 or so. Where you can only pair Apple's keyboard with one device at a time, the K380 can be paired to three. Which means from the same keyboard you can tap a button and be writing on your Mac mini, the iPhone or your iPad. 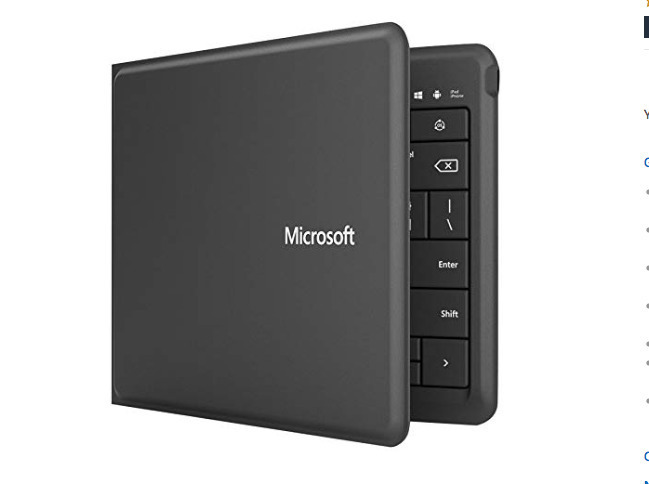 These are both wireless keyboards that come without numeric keypads but you can get similar models that have them. Such as Matias keyboards which like a combination of the old Logitech K811 and Apple's latest space gray Magic Keyboards with numeric keypads. It used to be easy: you got a keyboard with a numeric keypad because there was no other choice. The numeric keypad was always on the right, too, which was a pain if you're left-handed. Now, though, you need to choose between having a numeric keypad or not. Clearly, though, the chief consideration is whether you need one or not: if you don't enter a lot of numbers, you don't need one. Only, it's not that clear-cut. For as well as the numbers, a keyboard that has a numeric keypad also has arrow keys that aren't squeezed in around the space bar. They also have a block of six or nine keys that include the useful Page Up and Page Down ones. They tend to also include Print Screen which does something on Windows but you'll never press it on a Mac. Then there's often a Forward Delete key which you either rely on hourly or you've never been heard of. Even if it were only for the better position of the arrow keys, a keyboard with numeric keypad would appear to always be the best choice because it gives you options. You can choose to ignore a numeric keypad if you have one, you can't pretend one's there if it isn't. 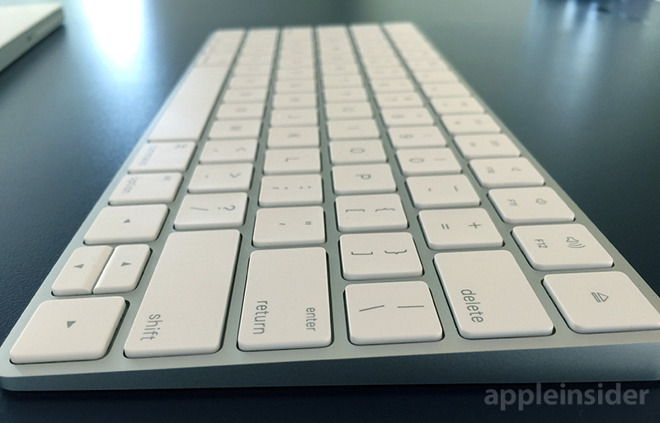 Take a look at Apple's own Magic Keyboard with Numeric Keypad, which costs around $120 in silver from Amazon. Except those options take up space on your desk and in the most significant part of it, too. If you place your trackpad to the right or if you use a mouse with your right hand, then the numeric keypad gets in the way. It's significant enough a difference that when you're used to using a keyboard without keypad it will be difficult to adjust. In theory, you also need to decide between two types of keys on a keyboard. There's the older sort where you have to press down quite far and they make a lot of noise. Or there's the more modern ones known as Chiclet-style which a much shallower depth of travel and tend to be quieter. In practice, you're going to buy a Chiclet keyboard. The older ones, known as mechanical keyboards are very good and you may well enjoy the feel and the sound. However, they're so outnumbered by the modern style that they're practically a niche product. If you want a mechanical keyboard, look at the $160 CODE illuminated one from WASD. This is a niche product within a niche product range, though. Even though we all use keyboards, the giant majority of us stick with whichever one comes with our computer and never change them. You, too, may well never change your Mac mini keyboard but you've got to get one first. And there is still one more decision to make. Easy. You don't need a backlit keyboard for your Mac mini. Where are you planning to work on it? In a basement with no lighting? Backlighting is no aid to typing: if you want to speed up the work you do on your Mac then learn to touch type and you'll never look at the backlit keys again. However, backlit keys do have one thing in their favor. They look tremendous. It does look great having a backlit keyboard. And wireless is appealing too: there is also a certain neatness in having a keyboard without a great big wire stretching out across your desk. Aesthetics matter: you may spend more time at your Mac than you do sleeping at night so it's worth getting something that is comfortable and looks good to you too. Which is a quick way of saying if you want a gold keyboard, you go for it. 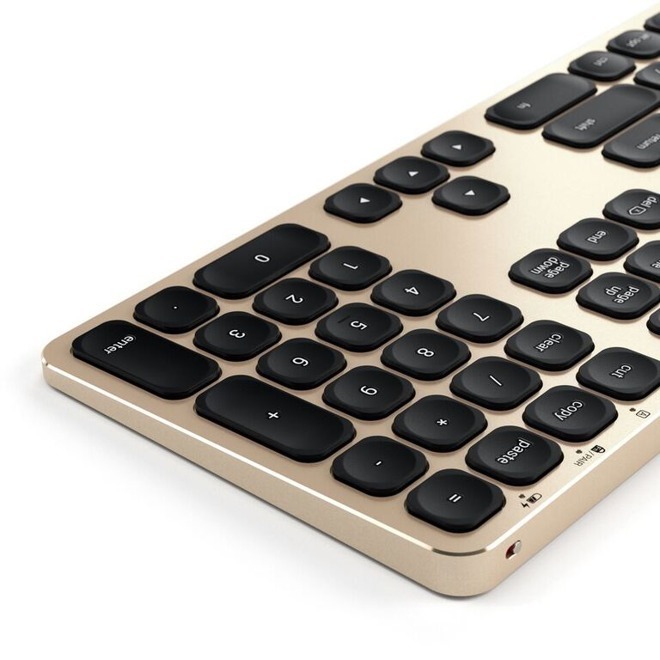 Satechi now sells wired and wireless aluminium keyboards for Macs. You'll pay from about $60 go $100 for one of these and that's not money you'd casually throw away on a whim. Yet for the difference a good keyboard makes to your Mac mini, it's a steal. We've spent much more over the years, trying out different keyboards and we still think that was worth it because finding the right keyboard is worth money, time and effort. If it weren't worth it, if keyboards weren't so important, it would be possible to pick out a single recommendation for absolutely everyone and we can't. No one can. However, if you think about wired or wireless, if you think about the numeric keypad plus the feel and color of the keys, you're on your way to finding the single best one for you.